Business Class gives you all of the power of Trello plus business-grade administrative permissions and security for your team. On top of that, all of your team's members get all of the benefits of Trello Gold. If you just upgraded to Business Class and need help setting up your team, please check Setting up your Business Class team or our webinar here. The following is a rundown of all of the Business Class features, click on any feature to jump to more detailed information. Business Class teams typically have projects that encompass a large number of boards. With Business Class, there is no limit to how many team boards can be opened. See here for more details on the difference between personal and team boards. Power-Ups give you the opportunity to integrate applications you use on a daily basis right into your Trello boards. While boards on free teams can turn on one Power-Up at any time, boards on Business Class teams can enable multiple Power-Ups per board. See Power-Ups by Trello and Power-Ups by our partners for more in-depth descriptions. Board Collections give you the ability to create groups of boards for your team. See Creating collections for Business Class teams for details on how to do this. Google Apps integration allows you to find people in your Google Apps domain and quickly add them to your team. 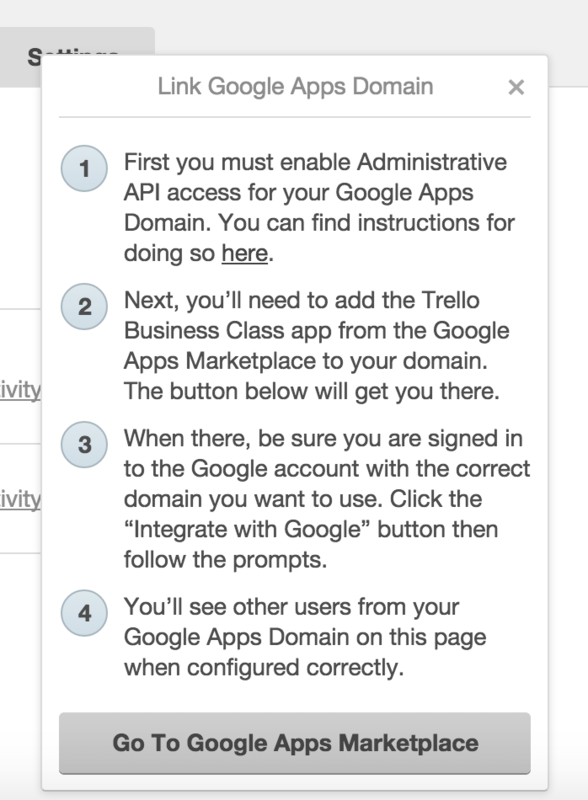 To add your team's Google Apps account, go to the Members tab and select “Link to Google Apps Domain”. With just a few clicks add your Google Apps Domain. Members of your domain will have an Add Member option. Team administrators can view, manage, and close all team boards, even if they are not the original creator of the board. This is helpful when a board admin leaves a team and a new admin needs to be assigned. If you are a team admin, you can see all team boards on the Boards tab of your team, even private team boards. With Trello Business Class team admins become super admins. As an admin, you can see all other boards in the team, even private boards you're not a member of. Business Class lets you control your team in several ways. You can control the visibility of boards created in your team, restrict team invites by domain or email address, as well as tweak board invitation permissions. You can read more about those permissions here. 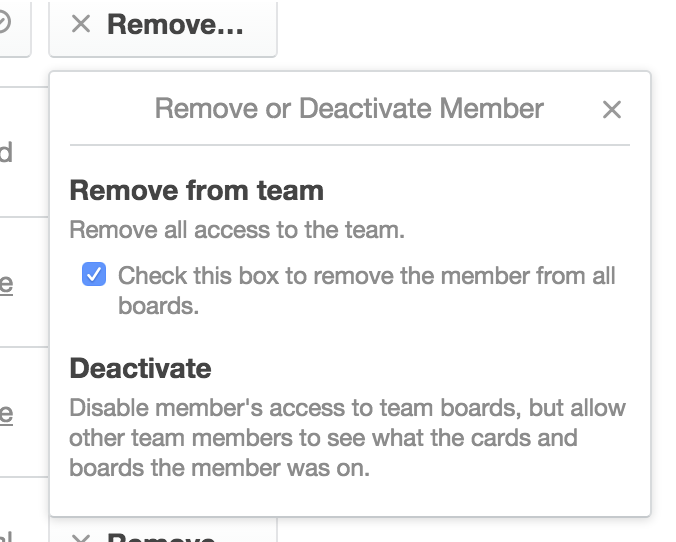 If someone leaves your Team, Business Class will give you the ability to deactivate a user in addition to simply removing them. Deactivated members will lose access to all boards in the team, but other team members will be able to see what boards and cards the member was on. This can help team members re-assign tasks that were previously assigned to the deactivated user. To deactivate a member, go to the Members tab, find the member and select deactivate from the “Remove” button. Deactivate members to keep track of the boards and cards that member was on. Observer status makes it easier to share boards and information with clients and vendors. Give people the ability to view, but not modify, private team boards, without needing to make the entire board public. 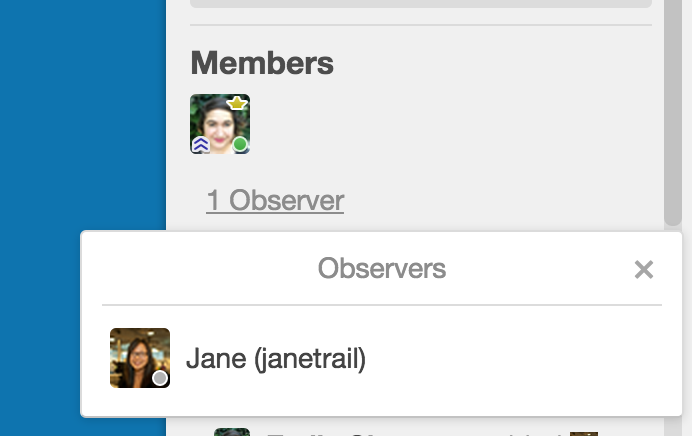 You can even invite people outside the team to be an observer on a board. 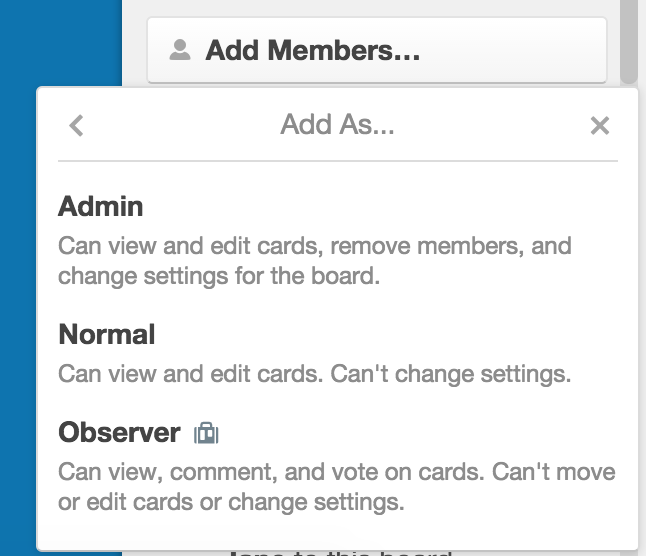 You can change current board members to observers by clicking their avatar in the right sidebar, selecting “Change Permissions”, and selecting “Observer”. To add a member as an observer, open a board, click “Add Members…”, find a member, select the arrow from the options right to the right, and select “Observer”. Confidently share boards with clients and vendors using "observer" status. 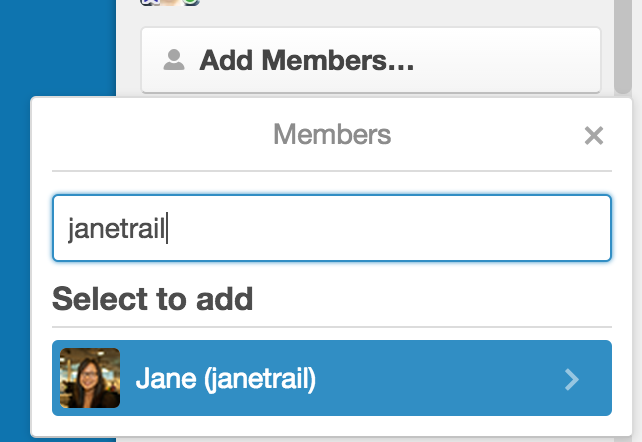 View your team's members activity in Trello. 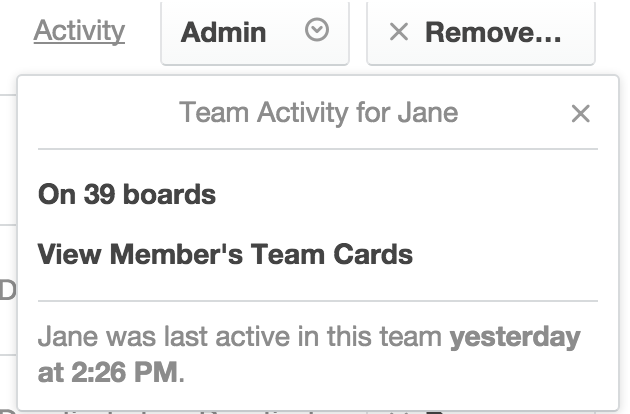 Saving searches allows members of your team to quickly recall frequent searches for cards on team boards, saving tons of time and typing. To save a search, enter your search terms and operators in the search field, click “Save this Search”, name your search and then click “Save”. Click “Back to Saved Searches” to view your saved searches. To execute a saved search, simply click it. For more information see this article on Saved Search. Export your team's data in just one click. 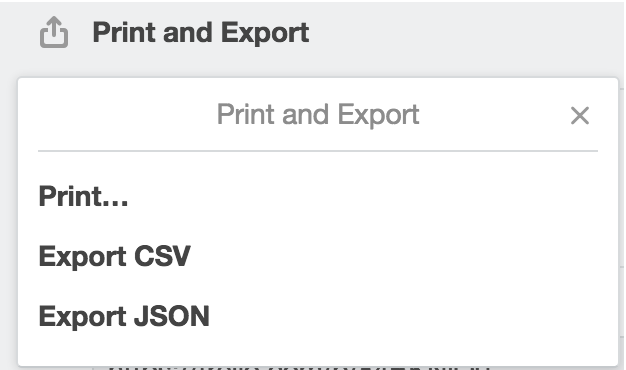 Click "Export CSV" to export your data. Check out the Billing tab to update credit card and billing information and view your invoices. You can cancel Trello Business Class via a link at the bottom of the Billing tab. Manage your billing information and view your billing history from the billing tab. Finally, we have a guide to walk you through your team's transition to Business Class. See setting up your Business Class team. Don't forget that the regular version of Trello still includes unlimited boards, users, and attachments.